An engaging Hero Indian Super League tie between FC Pune City and ATK ended 2-2 and provided plenty of entertainment but play-off hopes for either side took a beating. Pune took the lead in a see-saw tussle through Marko Stankovic’s deflected strike (17′). A superb goal from Jayesh Rane (23′) and a penalty by Edu Garcia (61′) looked to have turned the tables in ATK’s favour. But Robin Singh scored a header (73′) to help Pune clinch a point. ATK have lost the chance to move within a point of fourth-placed NorthEast United and stay sixth with 21 points from 15 matches while Pune City’s slim hopes of reaching the top-four have ended. With a victory the need of the hour for both sides, an end-to-end game of football unfolded and ATK came out all guns blazing. Marko Stankovic had an effort in the very second minute but his shot went inches over the bar. Edu Garcia too came close when his shot from the edge of the box struck the crossbar on its way out. 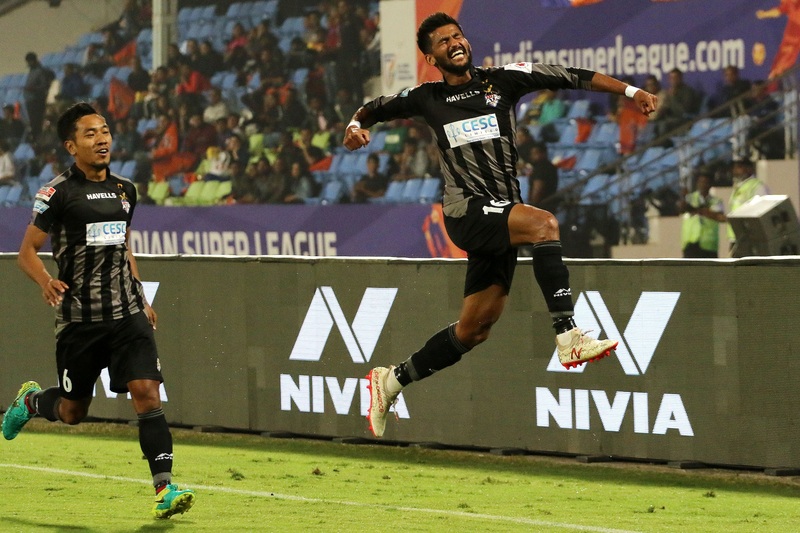 However, it were Pune who took the lead thanks to a Stankovic shot from range which took a wicked deflection off John Johnson’s trailing leg and nestled in the back of the net. This was after Robin Singh laid the ball on a platter for the onrushing Stankovic. However, the lead didn’t last long as Jayesh broke down the left wing, only to cut in and curl an exquisite shot into the far top corner. With confidence flowing through them, ATK took control of the match with Manuel Lanzarote looking in the mood. In the 25th minute, ATK could have surged ahead when Lanzarote’s volleyed effort was headed clear by Sahil Panwar which almost sneaked into the net. At the half an hour mark, Everton Santos attempted an overhead kick which went inches over the bar from a Lanzarote free-kick. The Kolkata side upped the ante as they committed more men forward while Pune preferred to sit back and hit on the counter. Four minutes after the break, Pune had the first chance of the second half when Iain Hume found Robin whose first time shot produced a diving save from Arindam Bhattacharya in the ATK goal. Just at the hour mark, Diego Carlos was adjudged to have handled the ball when going for a 50-50 ball with Everton. The resulting spot-kick was buried into the net by Garcia, who scored his second in three games to put his team 2-1 ahead. That goal sparked an onslaught from the Stallions as Marcelinho forced two good saves from Bhattacharya from free-kicks. ATK threw on Kalu Uche as they sought a winner badly but it was just not to be for them.